When Franciscan missionary Bernardino de Sahagún arrived in New Spain (Mexico) in 1529, he embarked on an extraordinary project: the compilation of an encyclopedic compendium of the world of the Aztecs in the wake of the Spanish conquest a decade earlier. Finally completed between 1576 and 1577 – essentially Sahagún’s life’s work – the result was the Historia general de las cosas de la Nueva España (the General History of the Things of New Spain). Sometime between 1578 and 1584 the manuscript was taken to Spain and by 1588 Sahagún’s Historia found its way to Florence, part of the Medici family’s magnificent collections. How exactly the Historia came into Medici hands remains unclear but that is where it still resides today, in the Biblioteca Medicea Laurenziana, which explains how the Historia became more commonly known as the Florentine Codex. Sahagún’s motivations for such an ambitious project can be found in his linked objectives to compose works in Náhuatl — the Aztecs’ main language — and to gain an understanding of the religious and cultural beliefs of the indigenous peoples in order to facilitate their meaningful conversion to Catholicism. Sahagún is often described as “the first anthropologist” or “ethnographer” because of the methods he employed in the collection and analysis of the information he gathered. His “ethnographic” practice included collaborations with indigenous elders as cultural informants from central Mexican towns. 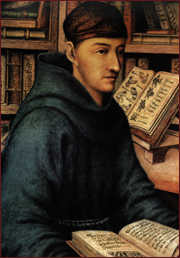 He also worked closely with Christianized young indigenous students and “grammarians” – indigenous scholars able to read and write in Latin, Spanish, and Náhuatl – and who Sahagún had taught in the Colegio de Santa Cruz de Tlatelolco, a school established in 1536 specifically to educate the sons of indigenous elites in grammar, rhetoric, and theology. Sahagún framed a series of questions for the indigenous elders on a wide range of topics that included their pre-conquest religion and rituals, natural history, education, and medicine, as well as on the Spanish conquest. The indigenous elders’ responses to Sahagún’s questions were recorded through their “paintings” — a pictographic and ideographic form of writing. 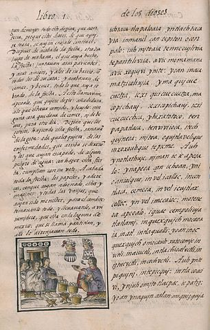 The indigenous “grammarians” and scribes, in turn, translated their responses and transcribed them into Náhuatl written in the Latin alphabet. To complete the process, Sahagún provided abbreviated Spanish translations of the Náhuatl responses and indigenous artists or tlacuilo provided illustrations. The Florentine Codex (folio 80) by Bernardino de Sahagún (1499-1590) . Via Wikimedia Commons. This process is embodied in the characteristics and physical appearance of the Florentine Codex. Composed of twelve books, a total of some 2,400 pages of text accompanied by a staggering 2,468 ink and color illustrations, and organized by individual topic (e.g. “Book I. The Gods,” “Book VII. The Sun, Moon, and Stars and the Binding of the Years”), the result is a bilingual codex with its pages divided into two parallel columns of Náhuatl and Spanish text. Although scholars have long acknowledged the inestimable value of the textual descriptions contained within the Florentine Codex, less attention has been paid to the illustrations in their own right. Fortunately, that is changing thanks to Diana Magaloni Kerpel’s innovative research and her insistence that we need to think about the Florentine Codex “as a work of art.” Her study illuminates the creative processes at work in the Florentine Codex and the indigenous artists behind them. With a nuanced appreciation for the actual fabrication and materiality of the Florentine Codex, Magaloni Kerpel’s research is an outstanding example of scholars’ new approaches to the Florentine Codex. Paying attention to the illustrations as works of art and thinking about the codex as an artifact and not just as a text to be mined for information, helps us to understand in provocatively fresh ways not only its creation but also the cultural exchanges and collaborations unleashed by the Spanish conquest and its aftermath both locally and globally. A digital version of the Florentine Codex can be accessed here and here. An English translation of the Florentine Codex is available as Florentine Codex: General History of the Things of New Spain, trans. Arthur J. O. Anderson and Charles E. Dibble, 12 volumes (Salt Lake City, 2012). 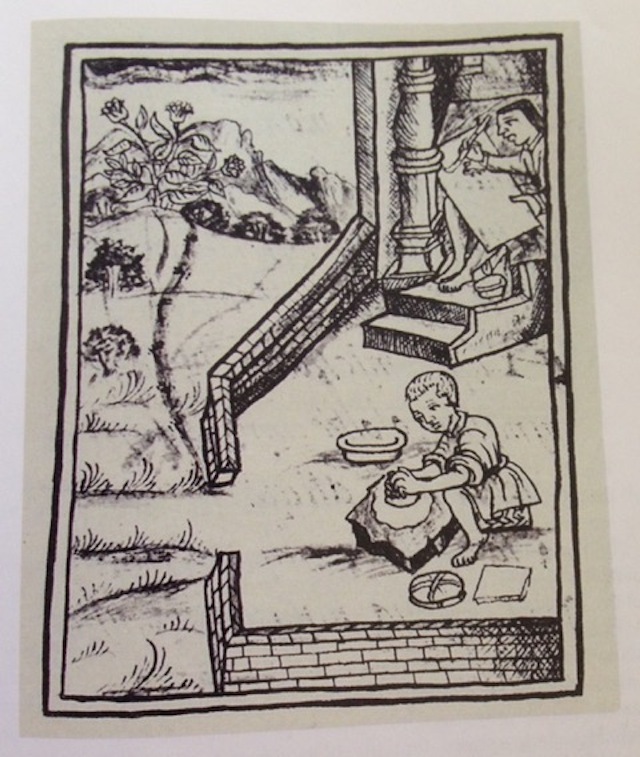 On Sahagún as an ethnographer, see Miguel León-Portilla, Bernardino de Sahagún: The First Anthropologist (Norman, OK, 2002).